"Eric Clapton, Layla - OBI Box Set with 7 LP Mini Replica CDs"
ERIC CLAPTON LAYLA OBI BOX SET WITH THESE TITLES - JOHN MAYALL AND THE BLUESBREAKERS - BLIND FAITH - DEREK AND THE DIMINO'S LAYLA - E.C. WAS HERE - THERE'S ONE IN EVERY CROWD - 461 OCEAN BOULEVARD AND SELF-TITLED - Japanese OBI MINI REPLICA LP TITLES making a 12 CD Box Set- Japanese OBI MINI REPLICA BOX SET Japanese re-mastered Mini LP replica Limited Edition Collection Recorded from the finest Original Masters available. Each title Comes with anti-static sleeves similar to Vinyl LPs, Cardboard packaging exact to the original LP, Re-sealable plastic wrap cases for protection of each collectible Actual miniaturized version of the 12" LP in 4" CD version Special VERY RARE LIMITED EDITION BOX SET ONLY PRODUCED ON FUTURES FOR THIS ONE TIME PRESSING -- were only available in Japan. ERIC CLAPTON LAYLA OBI BOX SET WITH THESE TITLES - JOHN MAYALL AND THE BLUESBREAKERS - Japanese remastered reissue of 1966 album, packaged in a limited edition miniature LP sleeve. Features the 12 tracks in mono and stereo Track Listings 1. All Your Love 2. Hideaway 3. Little Girl 4. Another Man 5. Double Crossing Time 6. What'd I Say 7. Key to Love 8. Parchman Farm 9. Have You Heard 10. Rambling on My Mind 11. Steppin' Out 12. It Ain't Right 13. All Your Love [Stereo Version] 14. Hideaway [Stereo Version] 15. Little Girl [Stereo Version] 16. Another Man [Stereo Version] 17. Double Crossing Time [Stereo Version] 18. What'd I Say [Stereo Version] 19. Key to Love [Stereo Version] 20. Parchman Farm [Stereo Version] 21. Have You Heard [Stereo Version] 22. Rambling on My Mind [Stereo Version] 23. Steppin' Out [Stereo Version] 24. It Ain't Right [Stereo Version] BLIND FAITH - Japanese remastered reissue of 1969 album, packaged in a limited edition miniature LP sleeve Track Listings 1. Had to Cry Today 2. Can't Find My Way Home 3. Well...All Right 4. Presence of the Lord 5. Sea of Joy 6. 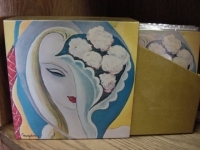 Do What You Like DEREK AND THE DIMINO'S LAYLA - Japanese remastered reissue of 1970 album Layla & Other Assorted Love Songs, packaged in a limited edition miniature LP sleeve Track Listings 1. I Looked Away 2. Bell Bottom Blues 3. Keep on Growing 4. Nobody Knows You When You're Down and Out 5. I Am Yours 6. Anyday 7. Key to the Highway 8. Tell the Truth 9. Why Does Love Got to Be So Sad? 10. Have You Ever Loved a Woman 11. Little Wing 12. It's Too Late 13. Layla 14. Thorn Tree in the Garden E.C. WAS HERE - Japanese remastered reissue of 1975 album, packaged in a limited edition miniature LP sleeve Track Listings 1. Have You Ever Loved a Woman 2. Presence of the Lord 3. Driftin' Blues 4. Can't Find My Way Home 5. Rambling on My Mind 6. Further on up the Road THERE'S ONE IN EVERY CROWD - Japanese remastered reissue of 1975 album, packaged in a limited edition miniature LP sleeve Track Listings 1. We've Been Told (Jesus Is Coming Soon) 2. Swing Low, Sweet Chariot 3. Little Rachel 4. Don't Blame Me 5. Sky Is Crying 6. Singin' the Blues 7. Better Make It Through Today 8. Pretty Blue Eyes 9. High 10. Opposites 461 OCEAN BOULEVARD - Japanese remastered reissue of 1974 album, packaged in a limited edition miniature LP sleeve Track Listings 1. Motherless Children 2. Give Me Strength 3. Willie and the Hand Jive 4. Get Ready 5. I Shot the Sheriff 6. I Can't Hold Out 7. Please Be With Me 8. Let It Grow 9. Steady Rollin' Man 10. Mainline Florida AND SELF-TITLED - Japanese remastered reissue of 1970 debut album, packaged in a limited edition miniature LP sleeve Track Listings 1. Slunky 2. Bad Boy 3. Lonesome and a Long Way from Home 4. After Midnight 5. Easy Now 6. Blues Power 7. Bottle of Red Wine 8. Lovin' You Lovin' Me 9. Told You for the Last Time 10. Don't Know Why 11. Let It Rain These are Japanese digitally re-mastered Mini LP replica CDs (the OBI Edition). This Limited Edition Collection has only VERY FEW made world-wide and are immediately Out of Print. Recorded from the finest Original Masters available. Comes with anti-static sleeves similar to Vinyl LPs, Cardboard packaging like an LP. Actual miniaturized version of the 12inch LP in 4inch CD version.